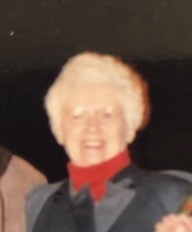 Elizabeth “Betty” Kerwick, 94, of Cranston, passed away on March 15, 2019 at the Scandinavian Home, Cranston. She is survived by her nieces Eileen Anne Dourado of Cranston and Joyce Kerwick Martin of Warwick. Born in Providence, a daughter of the late Arthur and Mary (Munnegal) Kerwick. Elizabeth was a life-long resident of the Edgewood section of Cranston. She was a communicate of St. Paul’s Parish in Cranston and a member of The Daughters of Isabella. She was also an avid Red Sox fan. She was the sister of the late Paul and William Kerwick and the late Mary Dunne and Jeanne E. Healey. Elizabeth also leaves behind several nieces and nephews. Mass of Christian burial will be celebrated Monday, March 25, 2019 at 10:00 am in St. Paul’s Church, 1 St. Paul Place Cranston, RI. Burial will be at St Francis Cemetery, 163 Smithfield Avenue, Pawtucket. RI. In lieu of flowers, please send donations in Elizabeth’s memory to St. Paul Church, 30 Warwick Ave., Cranston, Rhode Island 02905.